I close on my house in less than a month! I’m so nervous…so excited…so unprepared! I’d love to say that I’ve bought my new living room set, a new fridge and washer & dryer. But, the house I’m buying is a short sale. Absolutely nothing is set in stone until I pass papers. That means no big purchases. Instead, I’m passing my time with little purchases. All the stuff that I need and won’t be a pain in the a$$ to keep sitting in boxes if my closing doesn’t go as planned. yay - I get to comment! I am so excited for the new house. Do we get to see it once you move in and have it all unpacked? I hope so! I'll pray it all goes smoothly for the closing. 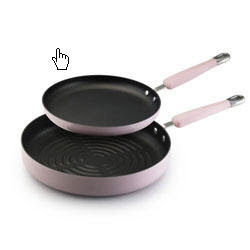 Also, love the pink cookware - who wouldn't have fun cooking with those!